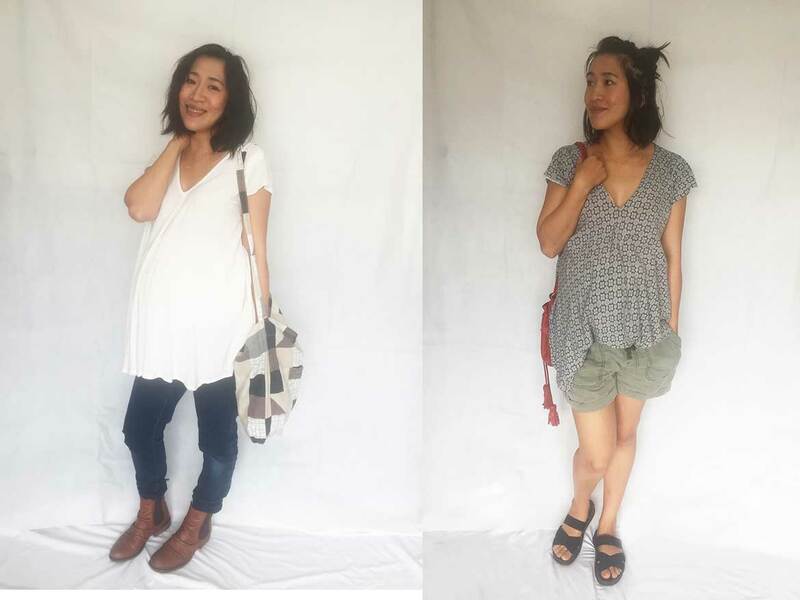 Here are 3 outfit ideas which are perfectly suitable to wear before and after pregnancy – all using the Koi drape front top from Hana Patterns. 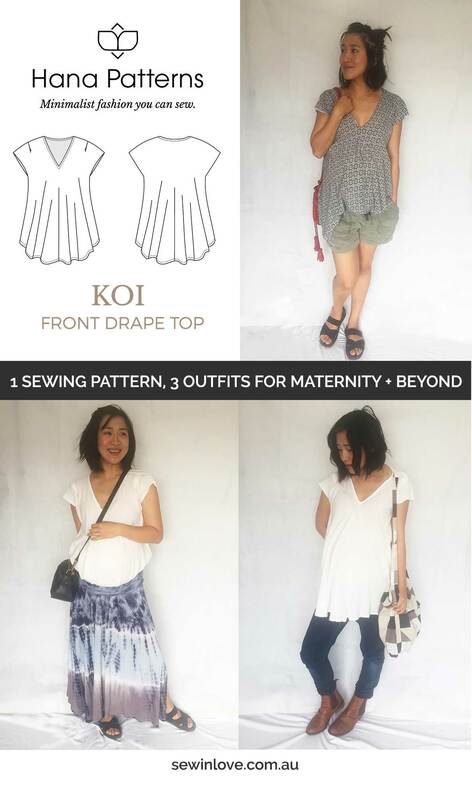 When I designed the Koi top, I never imagined how useful it would be for putting together pregnancy outfits. 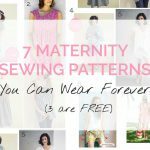 The volume of fabric at the front of this design completely covers your belly, and the length is just right to hide your maternity leggings or belly band. 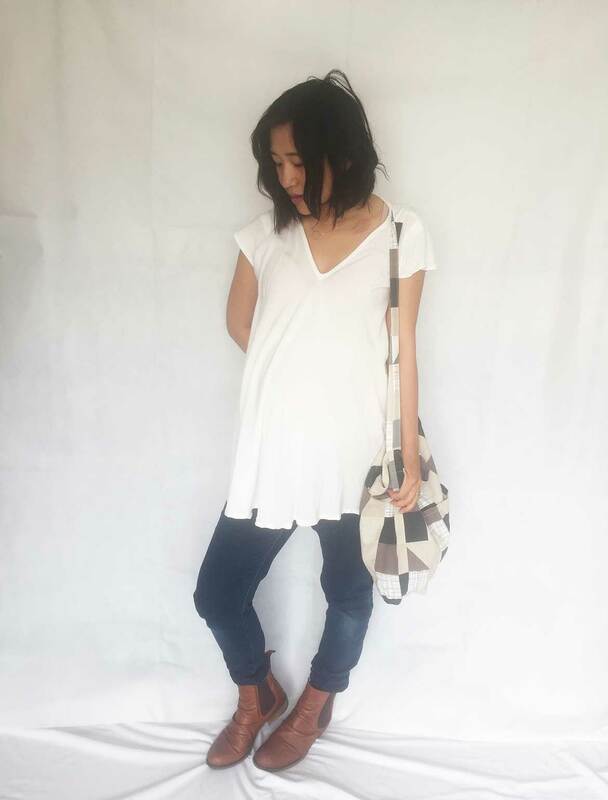 Of course, the great thing about the Koi top is that it was originally designed for non-maternity wear. 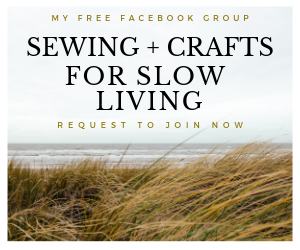 It’s a really versatile piece—I was really excited to design a top that looks good worn loose as a tunic AND tucked in as a blouse. 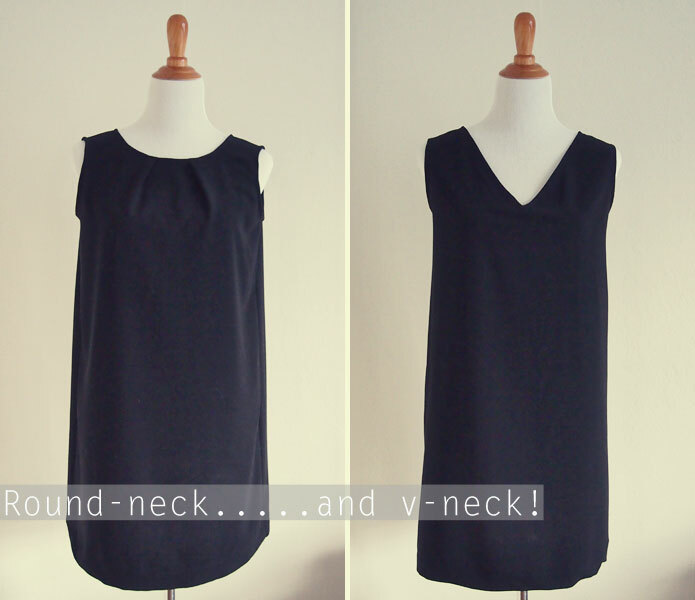 I have a feeling that the Koi’s low neckline will allow me to breastfeed in it as well! I’m sure I’ll be wearing these three outfits well beyond pregnancy. Skinny jeans and ankle booties have been my uniform for the last few years. This wasn’t about to change with my big 9 months belly! 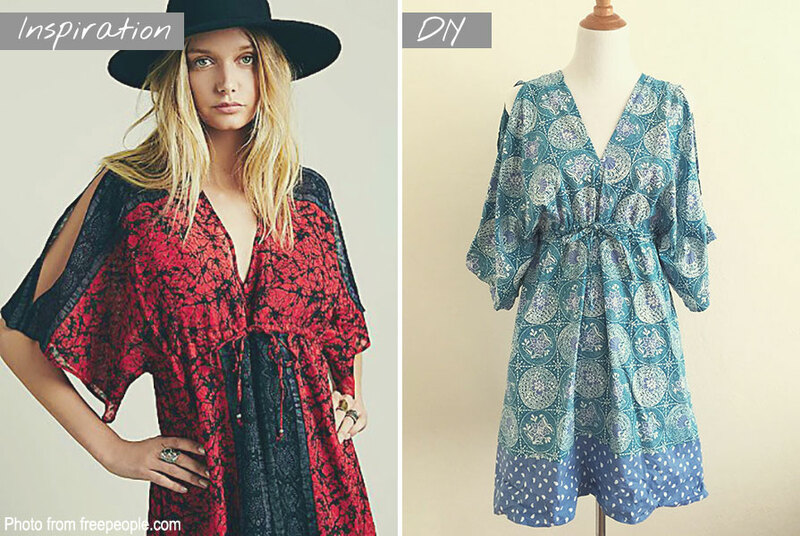 I love to dress up simple outfits like these with dainty gold jewellery. My favourite at the moment is a hexagon necklace from the Etsy store, LandonLacey. Tie-dye always reminds me of bohemian hangouts on the beach. 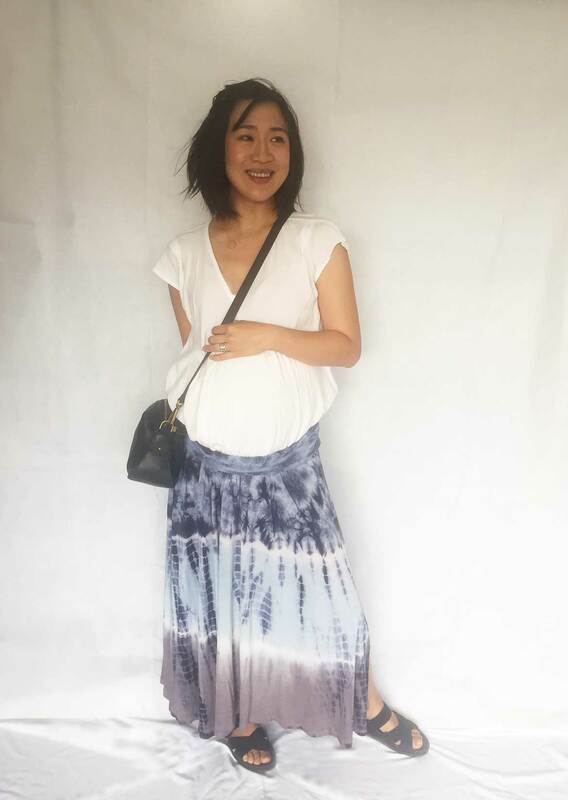 There’s plenty of fabric in the Koi top to tuck it into stretchy skirts like this tie-dye maxi. I have been living in these slip on sandals this pregnancy—they are so light and comfortable! I’m a bit embarrassed to tell you that they are by Crocs. Yep, the comfort shoe brand famous for those chunky, colourful clogs. This black elastic version doesn’t look like a typical Crocs shoe and once you’ve worn them, I’m sure you’ll be converted too. Especially if you are pregnant and comfort is number one! I’m now convinced that pants with elasticated waists are a great investment. I’ve been wearing all my non-maternity elastic pants throughout this pregnancy. I’m sure there’s some great sewing patterns out there too for pants like these. 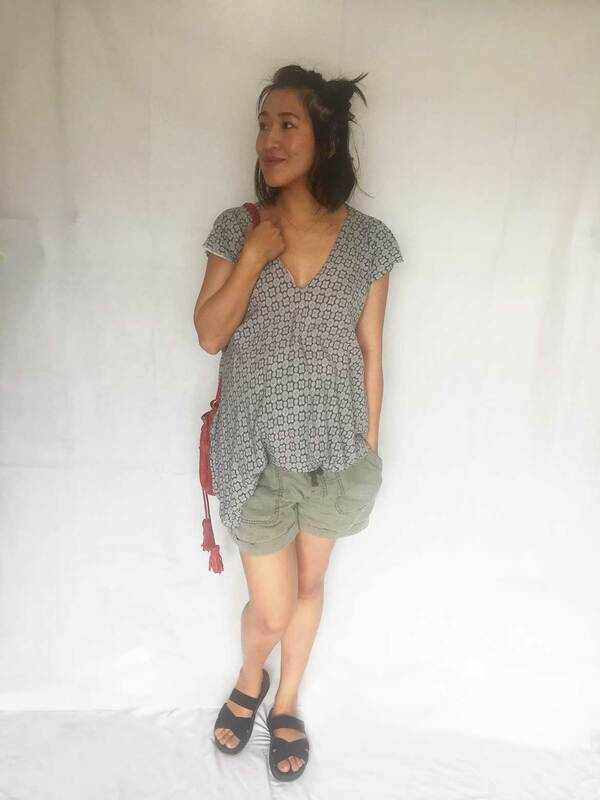 The draped shape of the Koi top is a really nice way to show off a printed fabric, like this block print rayon. When you are heavily pregnant but still need to chase an 18 months old around playgrounds, shorts are a must. Also, pockets are really important for those times when you need to wrangle a toddler into the car and there’s no time to rummage through your handbag for keys! 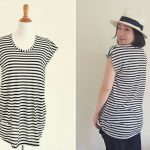 I hope I’ve given you some fresh ideas for styling a drapey top, whether it’s for maternity or beyond. The Koi sewing pattern is available as a PDF on the Hana Patterns website. I’m due to have the baby any moment now, so I’m looking forward to doing another outfit ideas blog post MINUS the belly!